I'm not sure about this one's origin, or indeed its legality... I suspect 'Rare Hits Vol. 1' (I've never seen a second volume) might not be entirely sanctioned. But never mind; neither is this blog, technically. Concluding this week's Mohd. 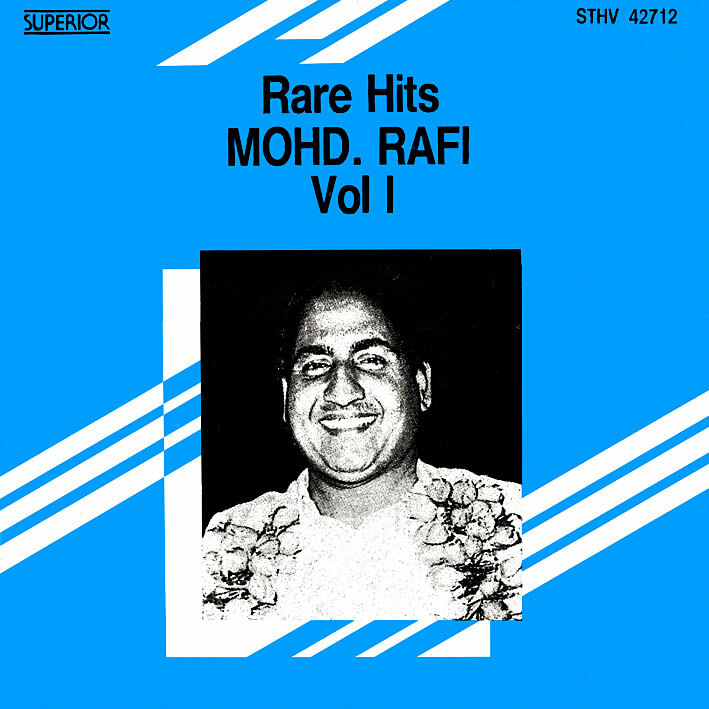 Rafi series then; sixteen tracks he recorded between 1961 and 1966, presented in chronological order. Whether or not they're actually rare, I have no idea. It's back to regular services next. Is this LP or an Audio Cassette rip coz HMV generally came out with Cassetttes with Superior Catalogue? It's an LP. I doubt HMV had anything to do with this release, there's nothing on cover or label to suggest they were. No country of origin either, although the record's Discogs entry says it's Dutch. Thank you so much for sharing this vinyl rip. Thanks PC, Yes! it is a cassette cover. Incidentally, I have this cassette though in poor sound quality, I purchased this when cassettes were in fashion and vinyls were loosing its grip over music lovers due to maintenance or whatever the reasons. It is really a gem of collection not easily available, that too in vinyl quality that makes it really must have collection for every music lover especially Mohd. Rafi fans. I appreciate comments/feedback, but as a non Hindi speaker I must admit I have no idea what you're saying. None of the links is functional. Pl. suggest any active link. Wrong. I've just checked and they work fine.